Blowing up Bits » Zigfrak — In space! October 1, 2014 | Posted in Adventure, Combat, Role playing, Sandbox, Simulation, Space | Comments Off on Zigfrak — In space! I really enjoy spaceship simulators. Some of my all time favourites include Privateer and Star Trek 25th Anniversary. For some reason role playing, space adventures just are not as common as they were during the glory days of DOS, but we can still find the odd gem here and there. I came across Zigfrak on Steam and thought it sounded promising. The game offered sandbox style exploration, role playing options and a large universe to fly around in at lots of enemies to dogfight. It all sounded very promising. Zigfrak starts out nicely, offering to guide us through a few tutorial missions. These early missions teach us how to do simple things like dock with nearby space stations, fly around a system, use the navigation map and pick up items with our tractor beam. As we proceed through the missions we gradually get into combat and learn how to interact with objects in the space nearby. For the most part I found the controls to be easy to learn. Zigfrak uses the mouse a lot and a good deal of what we do involves either pointing the mouse where we want to go or clicking on items we want to collect. There is a role playing element to Zigfrak, though I found the game to be fairly linear as far as missions are concerned. Typically we enter a region, get handed a mission, complete the mission, get offered another mission, and so on. After a while we are advised to proceed to another star system where we receive another list of missions to complete. Most of these missions involve blowing up enemy ships or performing recon or collecting space junk. One feature of Zigfrak I enjoyed early on was the way the game handles defeat. If our ship is defeated by enemies our spaceship doesn’t explode, we don’t need to return to base and start the mission over. Instead our ship is merely disabled for a short period of time. The enemy AI stops shooting at disabled ships, giving us time to effect repairs. (These repairs actually happen automatically.) Once our ship is repaired we can jump back into battle. This makes combat missions more fluid and saves us from restoring from earlier points of the game. That’s the good news. However, like many things in life, there is a flip side to this disabled-not-dead approach. Should our ship become disabled next to a large enemy ship we enter into a loop of disabled, repaired. Disabled, repaired. Disabled, repaired. … You get the idea, as soon as our ship is made whole it is knocked out of the sky again by the nearby foe. I’ve been playing Zigfrak for nearly a week now and I’m still not sure how I feel about the game. On the one hand it has great space exploration, role playing elements and some interesting challengers. Plus, spaceships! However, on the flip side I found some aspects of the game to be frustrating, mostly with regards to the interface. I found most items on the screen appeared quite small, even when the game was running full screen. Text is especially small and, in my opinion, hard to read. We are given lots of missions and ordered here and there (which is fun for a while), but I never really got a sense of purpose. Who are these people we are fighting, why are they after us, what is the ultimate goal, are we the good guys? These are questions which, up to this point, have gone largely unanswered. 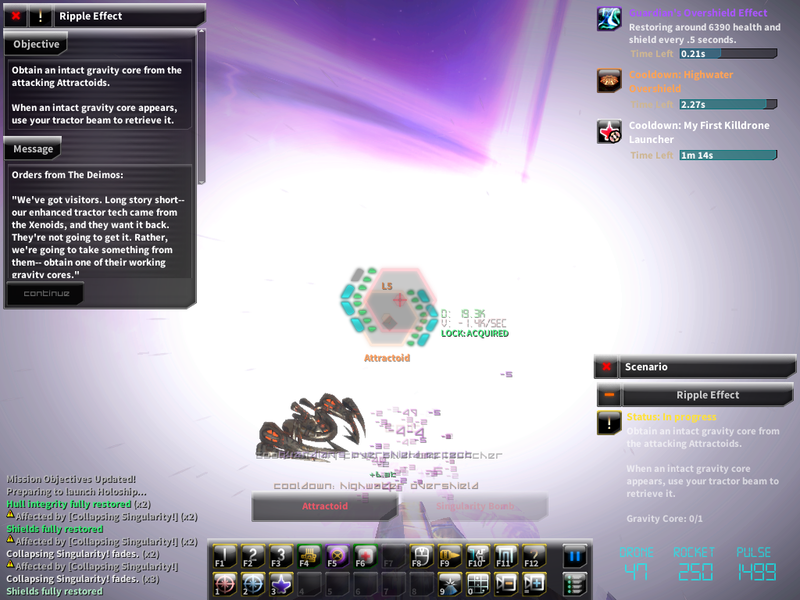 Mostly though what bothered me was how busy and bright the interface is during combat. I rarely had any idea how many foes I was facing in combat, who they were, what they were shooting at me or if I was effectively hurting them. The screen tended to be a big, colourful blur during combat. The display became a messy light show which eventually calmed down after I had fired (mostly) blindly at anything that moved. Some might say this is exciting, I found it disorienting. At the end of the week I have to say I’m still playing Zigfrak, still enjoying the exploration and hoping a firm plot will form. I like the dark humour and the variety of missions. I’d love to see an update to the game that tones down the interface and enlarges the text at some point. But for now, I’ve got to say the game has me hooked. Maybe I’m just a sucker for any game that will give me a spaceship to pilot, or maybe I like how simple the controls are. At any rate, Zigfrak is well worth trying out and, if you access it via Steam, there is a free demo with a few hours of game play available. Update: After this review was posted, one of the Zigfrak developers got in touch and helpfully pointed out that there is a slide-bar in the Interface portion of the Options screen which will adjust text size. I found cranking this slider up to the maximum greatly eased my ability to quickly (and clearly) read the status updates and mission details in the game. I would like to thank the Zigfrak team for politely pointing out this feature I missed and for helping me better enjoy their space RPG.